Matthew is a general and upper gastrointestinal surgeon with a special interest in minimally invasive surgery and endoscopy for both benign and malignant conditions of the upper gastrointestinal tract. Matthew treats a range of conditions including gastroesophageal reflux, hernias (including hiatal hernia), gallstones, obesity and tumours of the oesophagus and stomach. After graduating from Monash University in 2003, Matthew completed his residency and surgical training through Western Health in Melbourne. 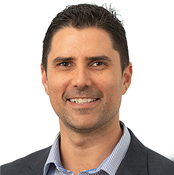 After completing his general surgical fellowship in 2016, Matthew was accepted by the Australian and New Zealand Gastro Oesophageal Surgery Association (ANZGOSA) for subspecialty training in the field of upper gastrointestinal surgery. This was undertaken at both St Vincent's and the Alfred Hospitals in Melbourne. These training posts provided Matthew with extensive experience in the management of complex upper gastrointestinal tract conditions. Commencing in late 2019, Matthew has also been accepted by the University Medical Center in Utrecht, the Netherlands, to undertake a surgical oncology fellowship with a special focus on robotic surgery. Matthew is nearing the completion of a PhD which has focused on the development of preclinical models to better understand oesophageal cancer and its precursor, Barrett’s oesophagus. This work has led to numerous publications, awards and international collaborations. Most recently, Matthew has been appointed to the advisory board of OESO, a worldwide organisation which focuses on diseases of the oesophagus. 2017 Peter Ryan Prize (Best Surgical Research Paper) St Vincent’s Hospital Research Week. 2016 SUGGS Medtronic Travelling Scholarship – Awarded for Best Oral Presentation. Combined ANZGOSA/SUGSS Meeting, Sydney. 2015 Best Early Career Investigator – Oral Presentation. Cabrini Research Day. 2015 John Ham Medal. GSA Annual Scientific Meeting, Cairns. 2014 Best Trainee Presentation, Upper GI Surgery Section. Annual Scientific Congress, Singapore. 2013 Professor Robert Thomas Translational Research Award. The Peter MacCallum Cancer Centre. 2013 Best Trainee Presentation, Surgical Oncology Section. Annual Scientific Congress, Auckland. 2019 Inaugural Surgeons’ Impact Fund Research Scholar, St Vincent’s Hospital, Melbourne . 2015 Viola Edith Reid Bequest, Faculty of Medicine, The University of Melbourne . 2012 & 2014 Sir Thomas Naghten Fitzgerald Scholarship, Faculty of Medicine, The University of Melbourne. 2013 Francis and Phyllis Thornell Shore Memorial Scholarship - Royal Australasian College of Surgeons. Matthew Read and the team at Melbourne Gastro Oesophageal Surgery team are extensively involved in research ensuring patients receive the most up to date and effective treatments. Faculty member (ASSET) at Royal Australasian College of Surgeons, faculty member (ASSET) (2018 – ongoing).